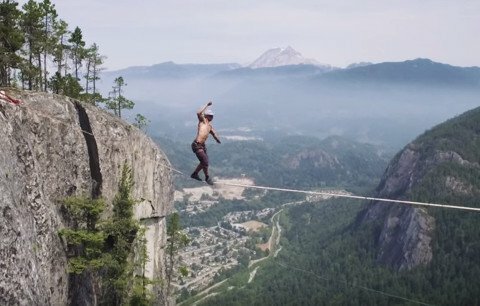 A Canadian daredevil has reportedly broken the record for longest free-solo slackline traverse by roughly 23 feet. Spencer Seabrooke spanned a 210-foot gap more than 950-feet above the ground with no harness — not even a safety rope, reports the CBC. Incredibly, Seabrooke actually falls off the line twice but catches himself. His feat of incredible nerves took place in the North Gully of Stawamus Chief Mountain in British Columbia, Canada. Zachary Moxley, who videotaped the stunt, said it was nerve-wracking to watch, to say the least. “This had to have been one of the most gut wrenching things I’ve experienced in my whole life, between operating the drone and watching him walk 290 meters above the earths floor, it was definitely something I have never experienced,” Moxley wrote to introduce the YouTube clip. Earlier this summer we brought you the story of French thrill seeker Nathan Paulin who slacklined a 403 m gap, well over Seabrooke’s feat, however Paulin was tethered. Slacklining is similar to tight rope walking only it uses a two-inch nylon line that’s slack so there’s so give and sway to the crossing. Some enthusiasts say it’s actually easier than tight rope walking. But try saying that when you’re 1,000 feet above the ground without a harness.